Provide comfort for the family of Helmut Paul Feller with a meaningful gesture of sympathy. 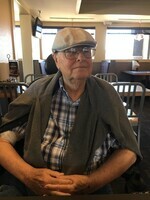 Helmut Paul Feller, age 84 of Alto, Georgia passed away on Sunday, December 2, 2018 following an extended illness. Born in Berlin, Germany on January 02, 1934, he was a son of the late Helmut Wilhelm Feller & the late Friedel Pock Marein. Mr. Feller was a Holocaust survivor who served his country proudly in the United States Army during the Vietnam War as well as the Korean Conflict. He was retired as a Certified Surgical Technologist with Northeast Georgia Medical Center after many years of dedicated service. Mr. Feller enjoyed traveling, going out to eat, and watching his fish aquarium. Most of all, he loved spending time with his family, especially his grandchildren. Mr. Feller attended Bible Landmark Church of Cornelia and was also a member of the Disabled American Veterans Gainesville/Hall Chapter #17. In addition to his parents, he was preceded in death by a sister, Sonja Joseph. Survivors include his wife of 34 years, Doris Turner Feller of Alto, GA; daughters & son-in-law, Regina & Charlie Cox of Cornelia, GA; Hildegard Feller of Alto, GA; grandchildren, David Cox & Lillian Cox of Cornelia, GA; a host of family & many friends. Funeral services are scheduled for 11:00 a.m. Tuesday, December 04, 2018 from the Chapel of McGahee-Griffin & Stewart Funeral Home with Evangelist Timothy Gerrin, Rev. Junior Robinson, & Rev. Ronald Hooper officiating. Interment will follow in the B.C. Grant Baptist Church Cemetery with Rev. Jonathan Arrowood officiating at the graveside. Military honors will be provided by the United States Army, Grant Reeves V.F.W. Post #7720, American Legion Post # 84, and the Rabun County Disabled American Veteran’s Chapter # 15. The family will receive friends at the funeral home from 2 until 4 p.m. & 6 until 8 p.m. on Monday. To send flowers in memory of Helmut Paul Feller, please visit our Heartfelt Sympathies Store. Consider providing a gift of comfort for the family of Helmut Paul Feller by sending flowers. We encourage you to share your most beloved memories of Helmut Paul here, so that the family and other loved ones can always see it. You can upload cherished photographs, or share your favorite stories, and can even comment on those shared by others.